Mediterranean Salad with Spiced Chickpeas, Please! Happy Canada Day! It’s a hot summer day. All I can think about for dinner is something cool, easy and delicious. 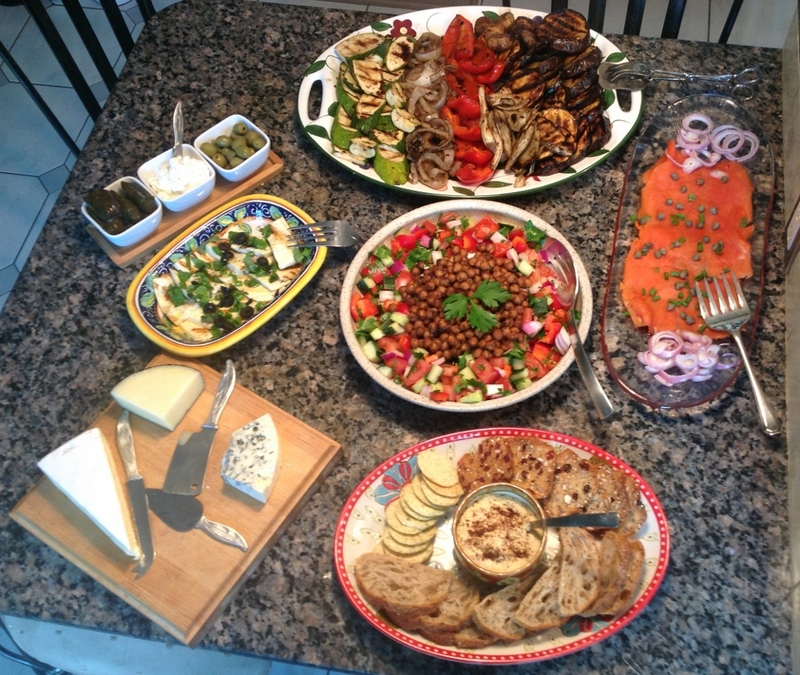 An appetizer-style dinner, with platters of salad, cheese and smoked salmon…Hmmm, maybe grilled vegetables barbequed up yesterday. The possibilities are endless. 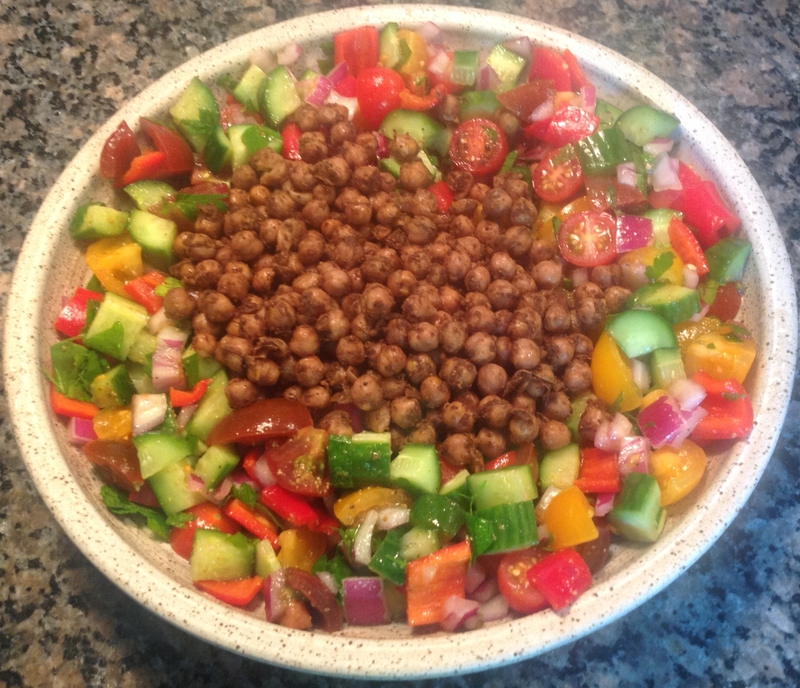 And today I want to share with you a favourite salad from the Jerusalem cookbook that is versatile: spiced chickpeas with a fresh vegetable salad. The combination of the fresh salad ingredients are endless and I prefer multi-coloured tomatoes and/or peppers to add additional brightness to the salad. I also like to add some cumin to the simple salad dressing that pairs well with the cumin in the spiced chickpeas. This salad combo can be served on its own, or part of a table buffet meal. 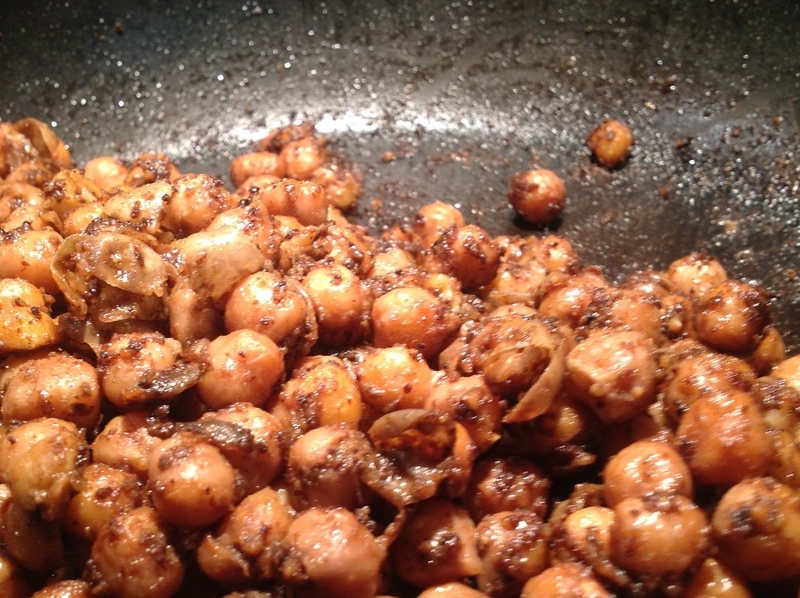 The combination of allspice, cumin and cardamom for the chickpeas are warm and aromatic. They are spiced, but not too ‘spicy’. Chickpeas are a fantastic legume full of protein and fibre and I have substituted them in many recipes to make them meatless. In a chicken tagine I shared with you a while back, I split the recipe ingredients in two, half with chicken and another half with chickpeas for a vegetarian guest. In future posts, I am planning a series of chickpea-based recipes for those meatless meals that have become more popular in my household. Using canned chickpeas make this recipe quick to put together. Just rinse well and drain. Coat the chickpeas in the spices and fry for a few minutes in some olive oil until aromatic. Take off the heat and let cool to room temperature. 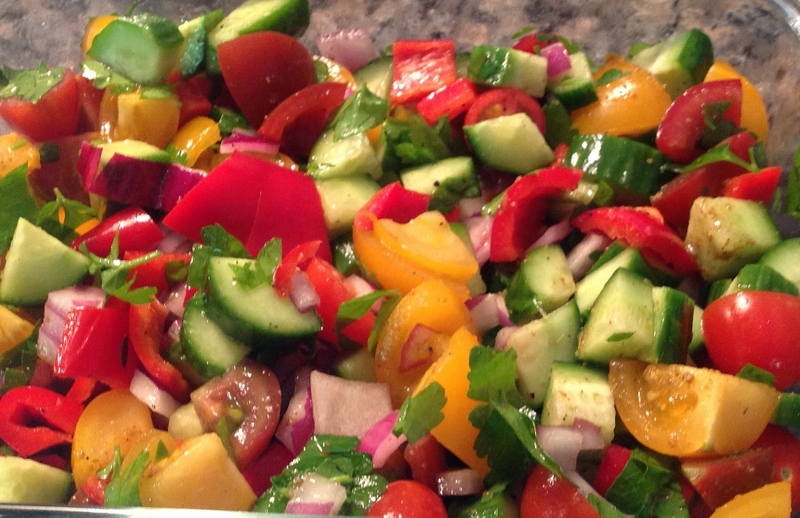 This salad is inviting with vegetables in vibrant colours. Vary the tomatoes and the peppers. Whatever the supermarket or farmers’ market has fresh for the day. 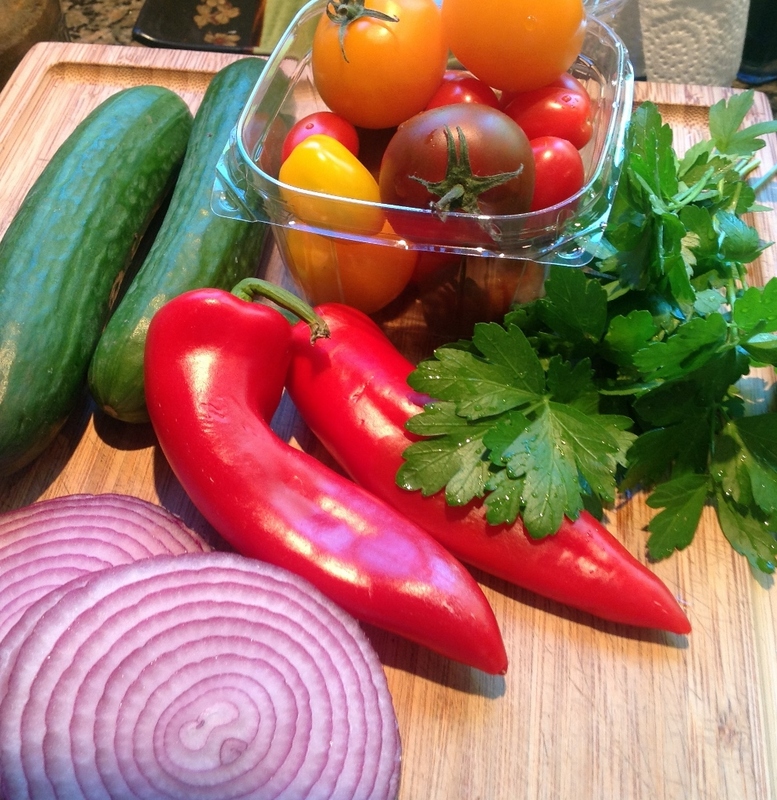 Chop the tomatoes, peppers and cucumbers into bite-size cubes, slice and chop the red onion and coarsely chop the parsley. The simplest dressing is the best. 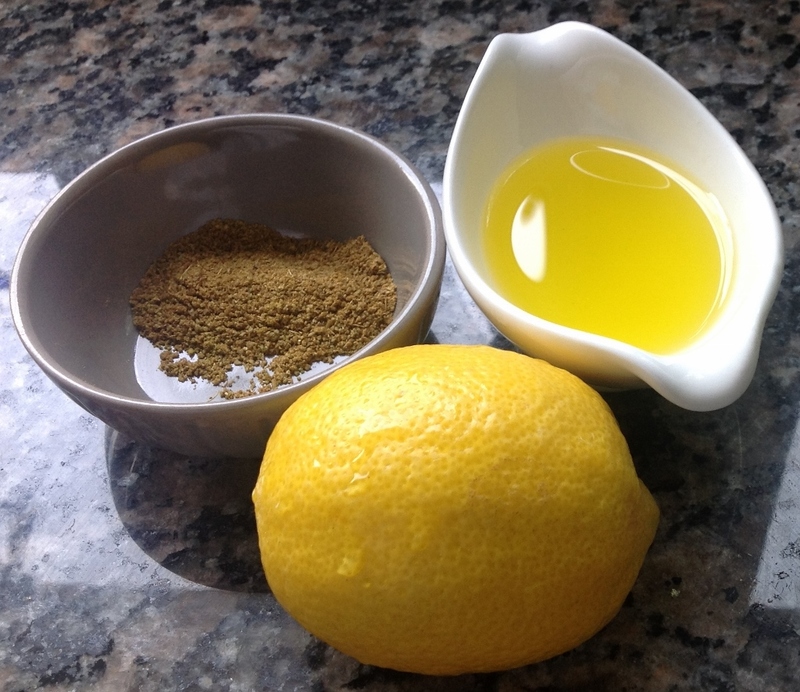 Freshly squeezed lemon juice, olive oil and a teaspoon of cumin (that’s a Moroccan addition I picked up in my travels). Salt and pepper, if needed. Dress the salad. It is delicious on its own but the addition of the chickpeas makes this a more substantial dish. Below is a buffet meal I prepared for a dinner party with friends. I grilled up mixed vegetables the night before, along with some halloumi cheese. Everything else is store-bought and plated: smoked salmon, hummus, cheese platter and dolmas (stuffed grape leaves) and olives…and more. Just suggestions….No more cooking and I get to sit down with my friends and enjoy! To prepare chickpeas, mix the cardamom, allspice, cumin and salt together in a bowl. Toss in chickpeas and coat well. 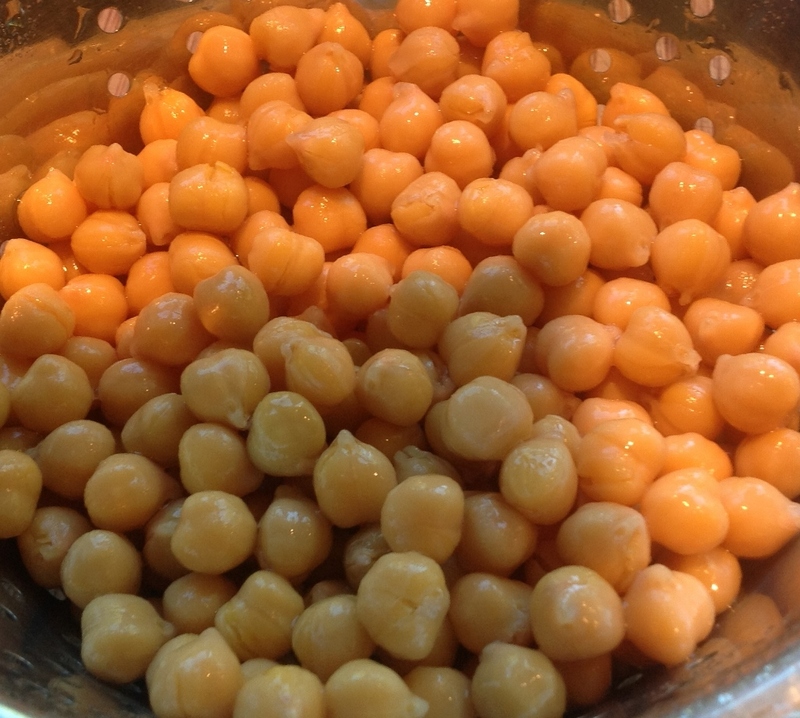 Heat olive oil over medium heat and lightly fry the chickpeas until fragrant, for about 2-3 minutes. Take off heat and let cool to room temperature. To prepare salad, cut the tomatoes, cucumbers, and pepper into 1/2 inch cubes. Slice the onion thin and chop into smaller pieces. Toss everything together in a bowl, add chopped parsley and finish with squeezed juice of lemon, olive oil and cumin. Add salt and pepper, to your taste. Plate the salad around the perimeter of a serving plate and spoon chickpeas in the centre. A beautiful dish to add to your dinner table. And a great salad for a warm day! And tastes great too! Come out and visit and I’ll make it for you! Great photos and a nice tapas dinner – happy Canada day!